In our experience, our users value the advertisements that we deliver along with search results and other web content because the ads help connect them to the information, products, and services they seek. Simply put, advertising is information, and relevant advertising is information that is useful to consumers. The advertising we deliver to our users complements the natural search results that we provide, because our users are often searching for products and services that our advertisers offer. Making this connection is critical. In fact, we strive to deliver the ads that are the most relevant to our users, not just the ones that generate the most revenue for us. This philosophy and advertising policy what has really made Google such a wonderful success. While most companies were working hard to deliver more obtrusive advertising, Google spent its time to find ways to deliver RELEVANT advertising. Google realized that you don't keep a visitor long when you have frustrating pop-ups, obnoxious flashing web banners, and misleading links and other schemes to increase revenues. Instead, Google developed a system of relevant, unobtrusive, text ads. The result was one of the most successful advertising programs in history, named AdWords. Clearly, Google needs to monetize YouTube and other video services. 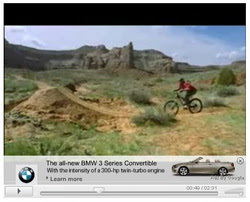 Since the videos themselves are the focus of the viewer, side ads are not likely to succeed. This means that at some point, the videos themselves will need to contain the advertisement. And it appears that they are now rolling out "InVideo Overlay Ads." This new advertising move represents the exact OPPOSITE of the philosophy that served Google so well in its AdWords program. Let me be clear, I'm not suggesting that YouTube should host videos for free without any revenue. In fact, I believe that displaying ads on the videos is quite a reasonable and legitimate means to support YouTube. However, the InVideo overlay ads are far from reasonable, and very VERY agitating to the YouTube audience. I submit that if YouTube continues this approach, it will see its viewership drop dramatically. Is this simply a complaint without a suggested alternative? No. If you visit Google's Video Ad Solutions page, linked above, you will notice another version of the ads: text ads. A text ad is displayed in the bottom portion of the video window. Now THIS, is quite a good start! 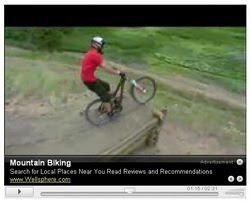 While you watch a video of mountain bikers, you see a text ad that suggests nearby places for you to go mountain biking. Simple. Relevant. WOW. This kind of advertisement is not annoying or disruptive; in fact, this is something visitors would WANT TO CLICK! Simply brilliant. Are Google's video text ads perfect? No. They are still rather obnoxious, but could be easily improved for a great overall experience. Consider the following changes that would appeal to the viewer while still retaining effectiveness for the advertiser. First, the size is too big. 20% of the viewing space is overkill. 10% seems more reasonable. Second, the overlay is too strong and opaque. 25-50% opacity would be less obrusive, while ensuring that the content can be read. And third, the 'slide in' approach to delivering the ad is annoying, as well as the 'flickering' as playback continues. Why not a simple 'fade in' effect? In short, the best way for Google to preserve and expand the YouTube audience, while implementing an advertising system, is to stick to the same philosophy it has always used. Delivering relevant advertisements is not only something the viewers will tolerate, it is something the viewers will value.